Hamsters are one of the best pets to get for your child to learn responsibility, but they also make great companions for adults. They are perfect for animal lovers who live in smaller homes, or those who do not have time to take care of a cat or dog. Of course, hamsters come with their own responsibilities; they need water, food, exercise, attention, and cage-cleaning on a regular basis. Speaking about cages, your hamster’s cage is the most essential item for ensuring your hamster’s well-being and health. It is where your furry friend will spend almost all of their time – sleeping, eating, playing, and pooping. So, you need a cage that has enough space for your hamster to live comfortably and exercise. To find the perfect cage, we have listed the top 5 hamster cages for 2018. Read on to find out more. Why is the right hamster cage so important? What types of hamster habitats are there? What are the best toys for my hamster? 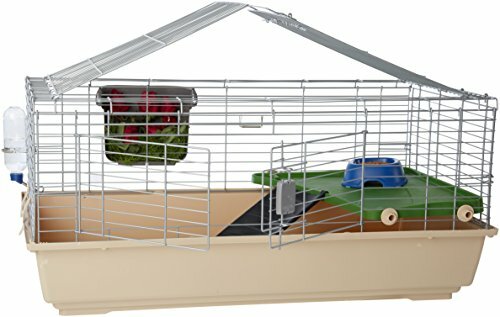 What type of cage does my hamster need? What bedding should I use in the cage? This cage has two floors, giving your hamster more space to explore. The robust plastic ensures durability and the base is transparent, so you can always keep an eye on your critter. This hamster cage looks a bit confusing when you first look at it, as it has the standard wire cage build on the top, but a transparent plastic base. This base allows you to keep an eye on your hamster no matter where they are in the cage. The two sections of this cage also allow you to separate the playing and feeding area from the eliminating and burrowing area. The wire cage is stable and pet-safe, and the base is durable transparent plastic. This hamster cage set comes with an exercise wheel, a hideout for your hamster, a water bottle, a ramp, and a food bowl. There is also an expansion cap built-in to the side of the cage, so you can easily add expansions. The transparent plastic base is great for keeping up with all of your furry friend’s activities. It is also built to be quite high, so you can add a substantial amount of bedding for your hamster to burrow through. If you plan to have a bigger or more than one hamster, you may find that this cage is a bit small. The water bottle also cannot be changed for one from another manufacturer. From your hamster’s basic needs to a rich environment, this AmazonBasics’ pet habitat cage has you covered. This cage has a balcony for your pet to watch the world from, and the space under it is ideal for hiding and resting. You can keep your hamster safely contained and comfortable thanks to the AmazonBasics Pet Habitat. The rectangle cage is durably built and features a PP plastic base and border at the bottom and an iron wire frame at the top. This ensures that the space is properly ventilated and that you can see your furry friend at all times. This hamster abode is available in three different sizes: standard, large, and jumbo. These cages are great for hamsters of any size but can also be used for guinea pigs and rabbits. There are large opening hatches at the front and top of the cage, so you can easily access the inside of the cage. When you need to clean, feed, or play with your little pal, these generously sized openings make it simple and safe. There is a balcony with an access ramp to allow your hamster to easily get up or down, and the tip-proof food bowl fits securely to the balcony floor. This hamster cage can be set up in less than a minute and does not require any tools. The large cage has plenty of space for your hamster to run around. The PP plastic bottom and the iron wire frame give you a high quality and long lasting home for your furry friend. The tie for the water bottle can be a bit flimsy. This cage is not big enough to house more than one or two smaller animals. The ramp is made from a slippery plastic which makes it difficult for hamsters to climb. If you are looking for a hamster habitat that comes complete with everything you could possibly need to get your hamster set up and comfortable in his new home, the Mcage cage has all you need and more. 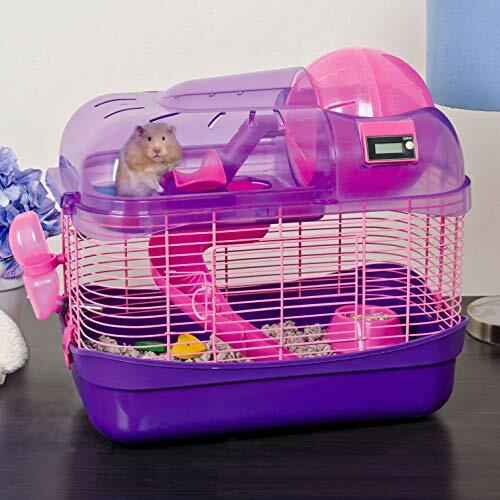 The Mcage hamster cage will allow you to keep your hamster safe, happy, and secure in the “hamster hotel.” The cage comes with a house, an exercise wheel, two mezzanine levels, two ladders, and a crossing bridge – giving your furry friend plenty to explore and enjoy in their surroundings. This hamster habitat is easy to clean thanks to the clip-off sections that allow you to lift the upper cage from the base. The food bowl and water dispenser allow you to easily take care of your pet’s needs. The vertical and horizontal bars allow your hamster to get a complete workout if they do not want to use the exercise wheel. 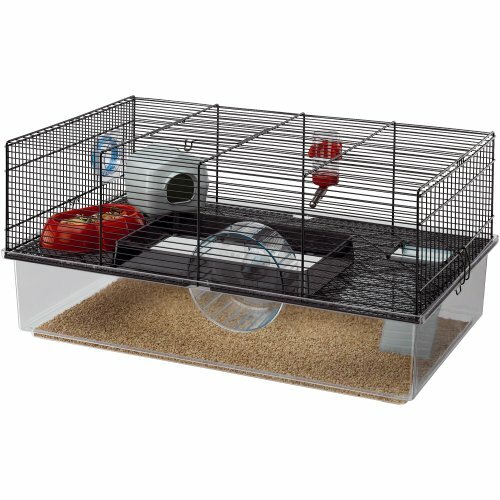 If you are looking for a comfortable set up for your hamster, this cage is a great place to start. The cage is large and has plenty of space to add accessories, toys, and tubing. The price is very reasonable, especially when compared to cages similar to this one. This habitat is big enough to accommodate 1 large hamster or multiple hamsters. The cage also allows for plenty of ventilation, so your hamster can breathe properly and won’t get too hot. The ramps and wheel will need to be replaced over time if you have a particularly boisterous hamster as they are not as strong as hoped. The cage only has a front hatch or a top hatch, not both, which can make it difficult to take your hamster out of the cage, to give your hamster food, or to clean the cage. The Living World Deluxe Habitat has everything you need for your hamster. It is a safe, hybrid cage with a wire frame at the top for ventilation and a plastic base at the bottom. It is essential to ensure that your hamster is safe in its cage. Hamsters can easily be frightened, so they need a place where they can hide and feel protected. This Living World cage gives your hamster everything it needs to feel comfortable and safe, including a water bottle, house, food bowl, and deep base for plenty of bedding to burrow through. The cage is made fully from wire which allows the cage to always be well ventilated. You do not need to worry that your pet doesn’t have enough oxygen or that it is too hot. The wire cage also ensures that odors dissipate, so the risk of disease is reduced. This cage comes with plenty of accessories, such as the drip proof water bottle and the access ramp. The hay guard helps ensure your pet’s safety, and the food dish will satisfy the biggest of appetites. All you need to do is add an exercise wheel and your hamster is set to go. 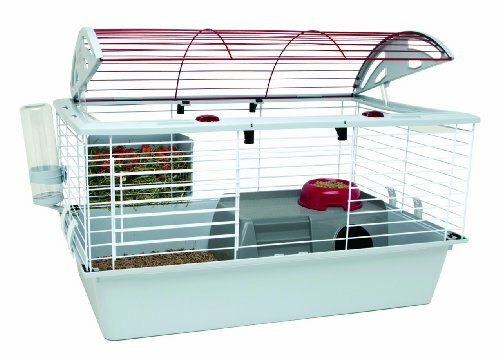 The Living World cage is very spacious and comfortable, giving your hamster plenty of room to run around and enjoy the space. The cage comes with the plastic clips needed to assemble the cage, making the process easy and quick. While this cage is roomy enough for a single hamster, you will find that housing a larger hamster or more than one hamster in this hamster habitat is not ideal. This cage does require some assembly, which can take a while if you do not follow the instructions. 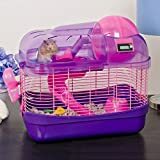 This expansive hamster habitat boasts a Critter Cyclometer that counts the revolutions of the exercise wheel, so you can see how much exercise your hamster has done. There is also a spiral slide ramp and a critter teeter totter to keep your furry friend occupied. The Spin City hamster cage is more than just a fun place for your furry friend to enjoy their time – it is also fun and entertaining for your family to watch as your hamster gets up to all sorts of antics. The critter cyclometer is especially useful to keep track of how much exercise your hamster has had. There are many fun features, such as the spiral slide and the critter teeter totter that will ensure your hamster is happy and energized at all times thanks to the healthy activities. 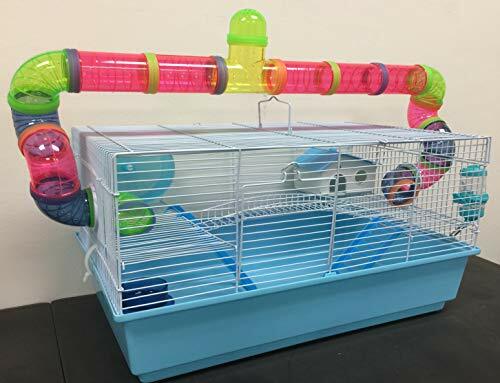 This cage set comes with a water bottle, food dish, critter teeter totter, exercise wheel with counter, and spiral slide, giving you everything you need to give your hamster a wonderful habitat. This cage is on the smaller side, but is still perfect for hamsters, gerbils, and mice. The critter cyclometer counts all of the revolutions your hamster makes on the exercise, allowing you to keep track of how much exercise your hamster has done. The spiral slide and the critter teeter totter also add another element of fun and exploration for your hamster. This cage is smaller than some others in the same niche, making it better suited to smaller hamsters and mice. Some parts of the cage are also a bit tricky to open and clean, such as the top ball. Selecting the correct hamster cage for your furry pet is about understanding the needs that are vital to your hamster’s well-being. Like any animal that is put in an enclosure away from their natural home, a hamster that is placed in an inappropriate cage may develop behavioral and health issues that can bring headaches and heartache to the owner. Here are a few of the things you should look out for when choosing a hamster habitat. If you have ever tried to live in a cramped space, you will know how it feels to not have enough room to move comfortably. The same can be said for your hamster, especially if you have a larger critter. It is essential that you choose a habitat that is appropriate for the size of your hamster. If you have a larger hamster, look for a cage that has a floor space of at least 150 square inches. If you have a smaller hamster, like a dwarf hamster, a minimum of 120 square inches is needed. You should also always aim to find a cage that is at least 10 inches of vertical space to allow your hamster to climb and move around, play, and exercise in a healthy way. As mentioned above, size is important, and this is particularly pertinent with regards to the living spaces for playing, resting, feeding, eliminating, and mating, if they are partnered. The space you give your hamster should be enough that they can live a happy and healthy life. Hamsters are very active creatures, so ensuring that they have tunnels, mazes, and exercise wheels will help them adjust to and enjoy their new surroundings when placed in the cage. As hamsters spend almost all of their time in their cage, it can get a bit smelly due to their elimination and general living. When choosing a cage for your hamster, look at how easy the cage will be to clean. You will need to clean your cage regularly to get rid of the urine, droppings, and other bodily fluids, so you don’t want a cage that is a hassle to clean. Cages that have complex tunnels, playhouses, and other accessories can be a chore to clean. Look for cages that have easy to reach areas and removable bases. All animals require oxygen to breathe, and if you do not ensure that your hamster’s cage has proper ventilation, it may suffocate. Wire cages are ideal for ventilation as the only closed section is the base tray which is filled with bedding. If you select a plastic cage, check that it has windows and panels with wire mesh that allows air flow. Be sure to place the hamster cage in an area that gets plenty of fresh air and do not close the cage into a room that does not get air flow. If there is one accessory that every hamster must have, it is an exercise wheel. Make sure that the cage you choose has an exercise wheel or buy one separately if it doesn’t. The exercise wheel you use should not have cross bars as they can cause your critter injury if their feet get trapped in the bars while spinning. Get a wheel that has a solid back, so no accidents happen. It’s also important for the wheel diameter to be a little bit bigger than the length of your hamster’s body. You need to ensure that there are no jagged edges or chewable hazards in the critter habitat that your hamster can chew on. Hamsters love gnawing and chewing on things, including their cage cars, especially when they are bored, if their cage is too small, or if they are lacking chewable toys. Even if you give your hamster an exercise wheel and a large cage, you may still find that they chew on the bars of the cage. Over time, they will wear down the plastic and may escape. Because of this, you must give them plenty of toys to play with and chew. A hamster’s teeth grow continuously, and they therefore need to chew and gnaw to manage the growth. Buying chew safe toys will ensure that your hamster is healthy and happy. There are many toys available on the market which you can give your hamster. You can also use different food treats such as monkey nuts, which are safe to chew on and keep your furry friend busy. The style of cage that you chew is a key feature to finding the perfect cage for your hamster. Adults tend to prefer wire cages due to neatness and functionality, whereas children love plastic cages that have ladders and tunnels where they can watch their hamster run around. Weigh out the pros and cons for each style of cage to find what will suit your home and budget the best. The type of material used to construct the cage you select is very important. If you choose a cage that has bars made from plastic, you may find that your hamster can chew through the bars, and they can also choke on the plastic if they swallow it. A plastic cage is typically safe, but if you have a mischievous hamster, or a furry friend who is easily bored, you may want to look at a wire cage for the sake of your hamster’s safety. Wire cages are safe and chew proof, ensuring that your hamster does not choke or escape. Hamsters are one of the most popular pets in households around the world. They are soft, small, and cuddly, and they provide many hours of entertainment and companionship for their owners. Having the right home for your critter is important for ensuring that they are happy and healthy, as well as comfortable. Having the right cage means your pet will enjoy their surroundings and will give you the opportunity to enjoy a content pet. Your hamster’s ability to grow and progress properly depends on the type of environment it lives in. There are many different styles, sized, and types of hamster cages available today, so you can find a cage to suit your hamster’s size, age, and energy levels. The three most common hamster cages are wire cages, plastic cages, and aquariums. Wire cages are one of the most popular and common hamster habitats. Ground floor space is the most important factor, so ensure there is plenty of space for your hamster to run. Wire cages must be kept out of cool or drafty areas. Check that the bars of the wire cage are close together to prevent injuries or escapes. Plastic cages are also very popular and are made from transparent plastic tubs. They are available in almost any size and are easy to clean. The snap-lock lids make them quite secure. You need to ensure that the ventilation in this type of cage is sufficient. Aquariums have become increasingly popular in recent years. A 10-gallon aquarium is the smallest you should use – the bigger the space, the better for your hamster. Aquariums are easy to find and fairly inexpensive. Aquariums hold bedding shavings well. They are quite heavy, so care must be taken when moving it. No matter which hamster habitat you select, you must keep it clean. Make sure you give the cage a good clean at least once a week using water and mild detergent. Rinse well. First and most importantly, an exercise wheel should be placed in the cage. These wheels allow your hamster to exercise and run as much as they want, whenever they want. Avoid wire wheels with rungs as these are known to cause injuries to hamsters’ feet and legs. Hamster balls are also quite a popular toy for hamster owners. A hamster ball allows you to place your hamster in the ball to roam freely and safely around the house; be sure to block off stairs and doorways to your yard. Homemade toys such as toilet paper rolls are also fun for your hamster to play with and crawl through. You can also use small boxes, such as a box from teabags, and cut peeping holes into it for your hamster to spy on the world around him. All hamsters need cages that make them feel protected and safe. They need lots of bedding and nesting material. Your hamster cage should be at least 10 inches high, but bigger hamster cages are even better because they let you put in more bedding and there is more space for your furry friend to run around. The cage you choose should always be made from a solid material like wire, plastic, or glass, and must not have sharp edges. The most important factors to consider when deciding what type of cage your hamster needs is your hamster’s breed, exercise needs, space requirements, and ease of cage cleaning. Once you have considered these factors, look at your budget and purchase the cage that suits your hamster’s needs best. Hamster bedding can be purchased at pet stores and most are good enough to use for your hamster. However, there are certain beddings that you should avoid for the safety of your furry friend. Never use pine, cedar, or scented bedding. Scented bedding can cause respiratory issues in hamsters. Beddings that are safe to buy vary based on odor control, amounts of dust, and liquid absorption abilities. The two main types of safe bedding are paper-based bedding, and wooden shavings which must be aspen as it is the only safe wood to use. Both of these types of bedding are good but paper based bedding is more popular as it absorbs liquids better than wooden shavings. You can also mix the two together for a more diverse bedding for your hamster. Hamsters are entertaining and engaging animals that are a wonderful first-time pet. The cage that you buy is a great way to safely watch your animal running on their exercise wheel or burrowing through their bedding. When selecting the right cage for your hamster, you need to find one that suits their needs. With all of the options available on the market, you will be able to find one that suits your hamster, the space available, and your home’s décor, if that is a concern. After carefully considering all of the above cages, our recommendation is the AmazonBasics Pet Habitat cage because it is spacious and comfortable for your hamster. It is easy to assemble and does not require any tools. There are three different sizes to choose from so you can find the perfect cage for your furry friend. The large openings at the front and top give you easy access when you want to feed or play with your hamster, and there is a hiding space under the balcony that your hamster can use as a sleeping spot or a hideaway where they can watch the world around them. The non-drip water bottle ensures that the bedding will stay dry, and the 1-year warranty on the habitat speaks of the cage’s quality. Plus, this hamster habitat is very reasonably priced and fits into most people’s budgets.